You’re here because you want to be more present when you’re with your kids. Kudos to you. I know you’re expecting a major scroll-down before you get to see my one simple tip. It’s overly simple – almost seemingly too simple. And it doesn’t make much sense. You’re with your kid. You’re playing and having fun. You’re there, but you’re really not. Your mind is racing through your to-do list. You cast your eyes into the next room and see the mess. You remember that you still have laundry to switch from the washer to the dryer since the morning. You wonder if that client emailed you back yet to close the project. You quickly check the time on your smartphone to see if you’re late on dinner prep. Then your kid looks up at you, waiting for a response. Give yourself a break! Seriously. Us mamas always find a way to put ourselves down. To criticize what we do. To think we’re not good enough. Well, cut it out! Because guess what? You ARE a good mother. Otherwise reading an article like this wouldn’t even be on your radar. Do you have any idea how ahead of the game you already are? I read a life-changing book a long time ago: Eckhart Tolle’s A New Earth. At a time when I was down, frustrated, unhappy and fundamentally dissatisfied with my career, it made me realize that I did have the power within me to control my damaging thoughts. It went a step further to explain how, as humans, we are not our thoughts. We are the beings behind those thoughts. I think in many ways we’ve become a little too obsessed about controlling and suppressing our thoughts so that we can be more present. So we can live in the now. So we can experience life moment by moment. Don’t get me wrong. I believe strongly in this concept and it’s extremely important – especially for those of us who are Type A personalities trying to do a million things at once all the time. But my dad gave me a whole new perspective not too long ago. I’m 5 ½ months into my second pregnancy now, and man, when I tell you that I’m an EMOTIONAL AND MENTAL BASKETCASE, well the all CAPS doesn’t even begin to describe it. My mind is my worst enemy these past few months. It wanders like crazy. I spiral out of control and either wind up in tears or the worst mood ever. It was a totally different perspective from what I was used to – something along the lines of “…you’ve gotta learn to control those thoughts…” No. This was different. And empowering in a whole new way. So how does this apply to you and your wandering mind when you’re with your kids? Forget about the thoughts and focus instead on the way you act with your kids. Because actions are what really matter, not what’s going on behind the scenes. Having said that, if you can stop your mind from wandering when you’re spending time with your children, I do believe that you will be happier. So here’s where my F*CK IT tip comes into play. Let’s revisit our little scenario above. You’re having fun with your kid – or at least trying to. But all these other things keep flooding your mind and raining on your perfect play session. Now, the great thing about my F*CK IT strategy is that it’s easy to remember (who can’t remember those two words?!) and easy to apply. I’ve learned that one of the hardest things about practicing mindfulness and staying present is catching yourself in the moment. And I’m talking about the exact moment when you start to slip away. In those few critical seconds, a “useful” checklist of points ain’t gonna help you. You need something fast. Something emphatic. Something that acts as a reminder and a cue just as much as a solution. You cast your eyes into the next room and see the mess. You remember that you still have laundry to switch from the washer to the dryer since the morning. You wonder if that client emailed you back yet to close the project. You quickly check the time on your smartphone to see if you’re late on dinner prep. And when something feels good, it usually works. And it’s something you’ll likely use again. Talk about empowering, well this is a whole other realm of empowerment. Making the decision to say “F*CK IT” – just for now – is crazy empowering. And that’s the key to my tip. I’m not telling you to F*CK IT forever. Just for now. Just for this moment. Just for this special time you have with your kids before they get dropped off at school or go to daycare or take a nap or go to bed for the night. Yeah okay, you’ll set yourself back a few minutes later on and you’ll probably get a little less sleep. All good things come at a price, remember? This is key. Catch yourself in it. Notice it. Feel it coming on. You’ll get better and better at this step over time. I guarantee that 99.9% of the time, the answer to this question will be “no”. Say those two powerful words in your head – with oomph! You made your decision (it was a damn good one, and you know it). Relish in it and enjoy your kids to the fullest. Every second is new and exciting. Now you won’t miss a single detail. Whatever you put off for the sake of your kids, deal with it later. Back to reality. Kids are gone. Now it’s time to get back to work, to clean the house, to finish the laundry – whatever. Be efficient and get down to it. When everything is done, it’ll all have been worth it. 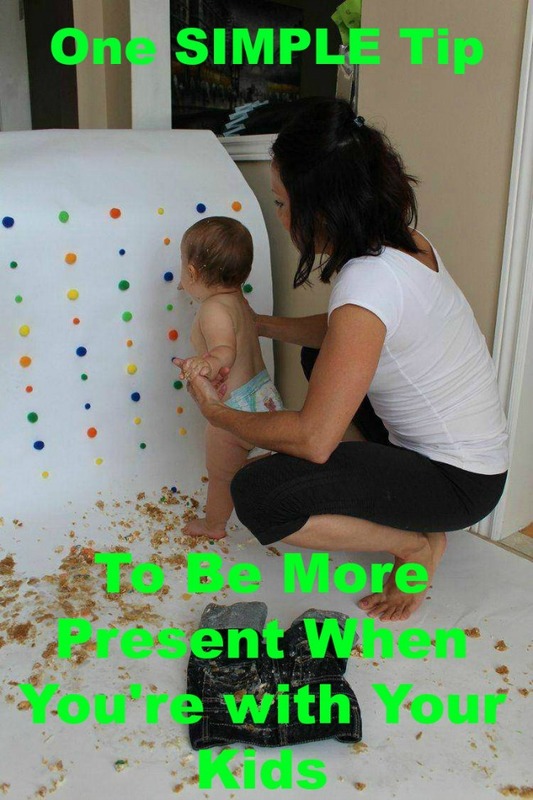 Are you making an effort to be more present when you’re with your kids? Tell me how!